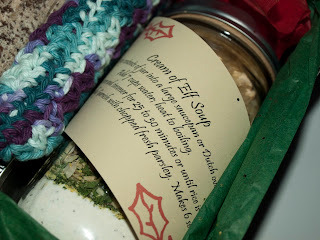 This is yet another soup that was made for my "Naughty and Nice" gifts. This soup is just amazing, and the kudos for the awesome name goes to my husband, who giggled for a long time before he was even able to share it with me. It's easy to put together, and it looks incredible in the jar. Pour Pioneer Country Gravy Mix into wide-mouth pint jar. In small bowl, stir together bouillon granules, onion, celery and parsley. Pour into jar to make second layer. 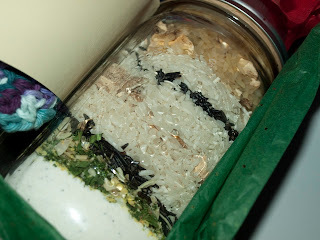 Add layers of wild rice, white rice and mushrooms. Seal with lid. Decorate the jar with cloth, stickers or ribbon and don't forget to include a tag with the cooking instructions! Empty contents of jar into a large saucepan. Add 7 cups water; heat to boiling. Reduce heat; cover and simmer for 25 to 30 minutes or until rice is tender, stirring occasionally. Garnish with chopped fresh parsley. Makes 6 servings.